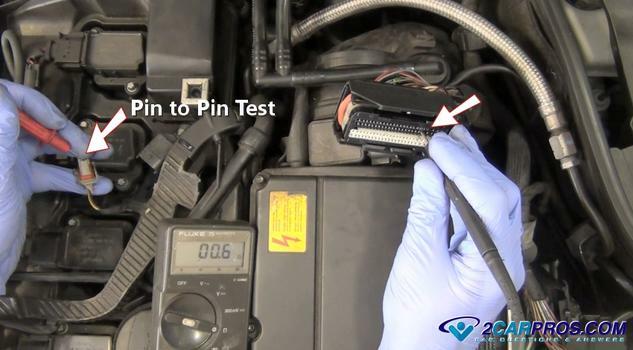 Need to test your wiring? 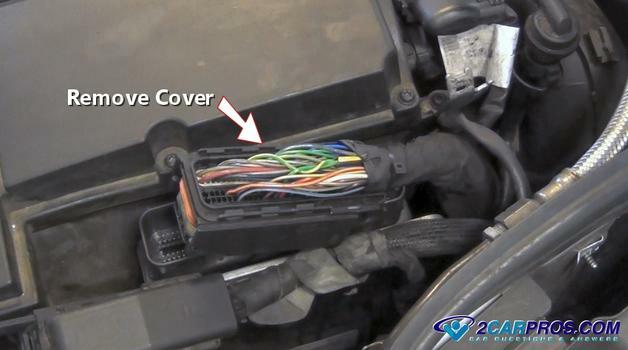 All cars use wiring harnesses to connect various sensors and accessories to the computer ECU in order for the systems to work. 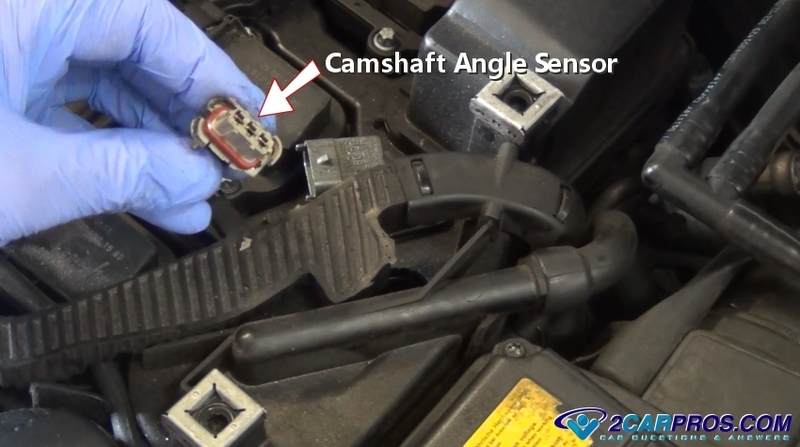 This guide will help when you have replaced a particular sensor such as a camshaft angle sensor but still have the same trouble code. The computer electrical system relies on a good connection between a sensor or actuator and the computer. 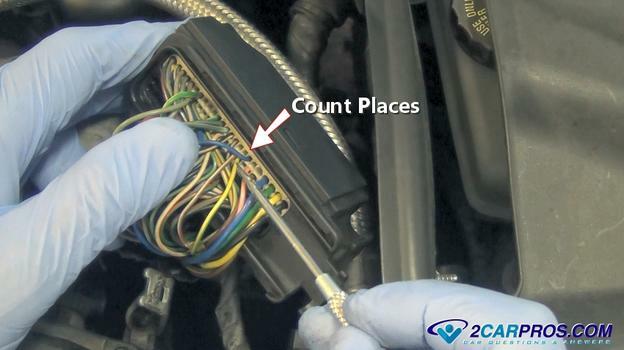 Over time engine vibration and road conditions such as heat, rain, snow and the natural aging of wiring can cause these connections to become loose, broken, damaged or corroded. This causes the computer to think there is still a problem even though the component has been replaced. 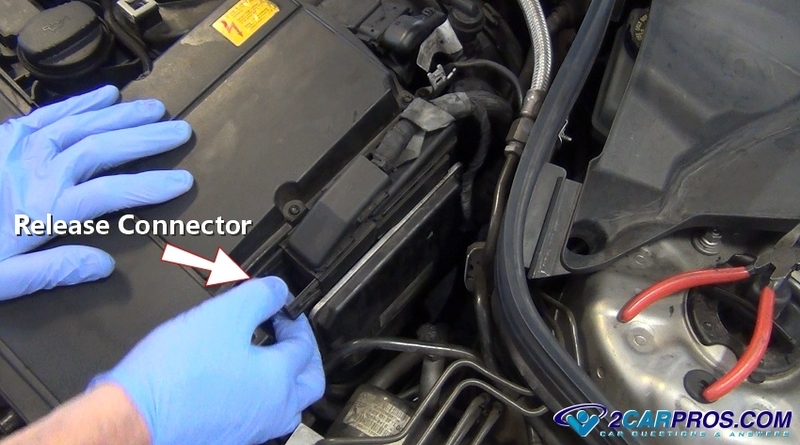 In this guide will be testing the camshaft angle actuator and position sensor wiring because a code for the actuator and sensor circuit is present and they both have already been replaced. The trouble code has been cleared and comes right back after a few miles of driving. Let's jump right in. Every sensor or actuator has a wiring connector. These connectors are comprised of one or more terminals and can represent a computer ground, system voltage and a reference and in some case an output wire that will control an actuator or motor. Each sensor can use any number of terminals (wires) to perform their task. 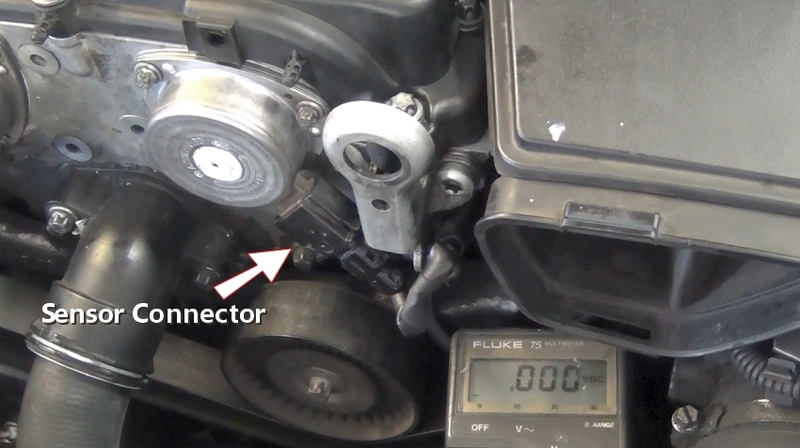 The camshaft actuator below uses just two wires to do its job. These two wires represent a power wire from the system and ground which is controlled by the computer. First we will check to see if the actuator is getting power. Disconnect the connector from the sensor. Check the wiring at the base of the connector this is a popular place for the wiring to break. Look for broken or loose wiring insulation or damaged pins as well. Most sensors in a computer system run off of reference voltage, from 5 to 12 volts in most cases. This voltage is supplied by the computer or a fuse when the system is turned on. The computer then uses this voltage to "power up" the sensors, actuators or motors so it can make its readings and adjustments. 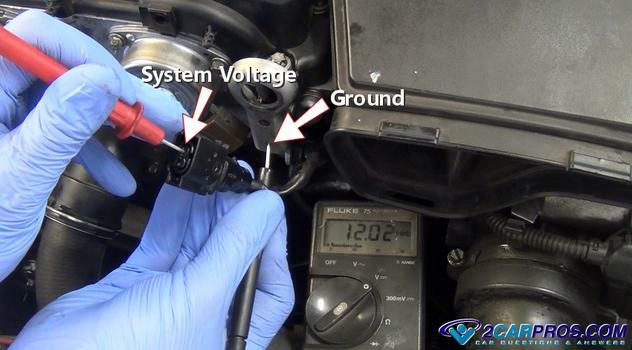 This can also help see if the computer system itself has power, you may have a simple problem such as a blown fuse. With the ignition key on, switch a voltmeter to DC voltage. Then touch the negative lead to a good ground source. 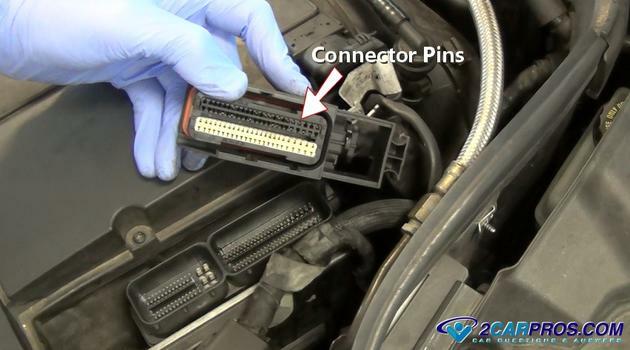 Use the positive lead to probe the connector terminals you should be able to find system voltage. System voltage is shared by most of the computers sensors, actuators and motors. 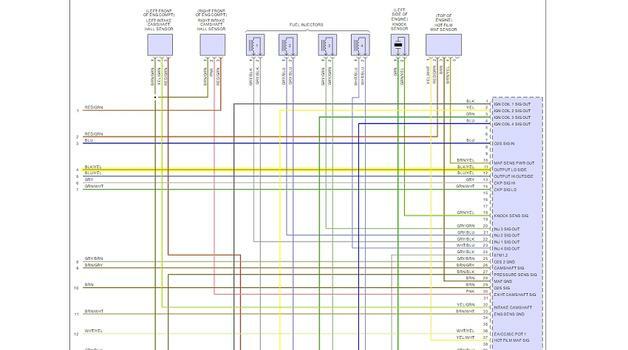 For this step it helps to have a wiring diagram but it is not needed. All computer wiring is identified by specific wiring color code such as, yellow and green yl/gn which means yellow with a green stripe. The color motioned first is the main color of the wire followed by the tracer color which will be a small line on the wire. This color code will be the same from the sensor to the computer. In this example we will use the camshaft angle or position sensor. This is a three wiring sensor, one wire is used for sensor power, the other two go directly into the computer for sensing purposes. Once system power is confirmed with the key on, the next step is to test the connection between the sensor and the computer which will find broken wires. 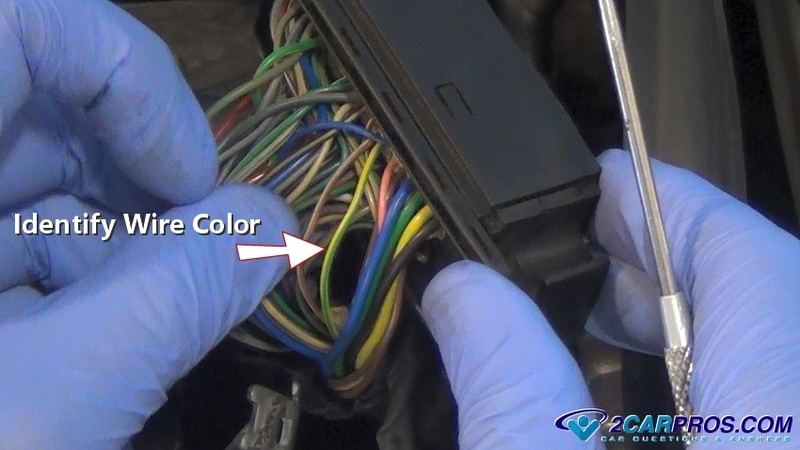 Identify the connector wiring colors, you may need to strip the wiring cover back to see the individual colors. 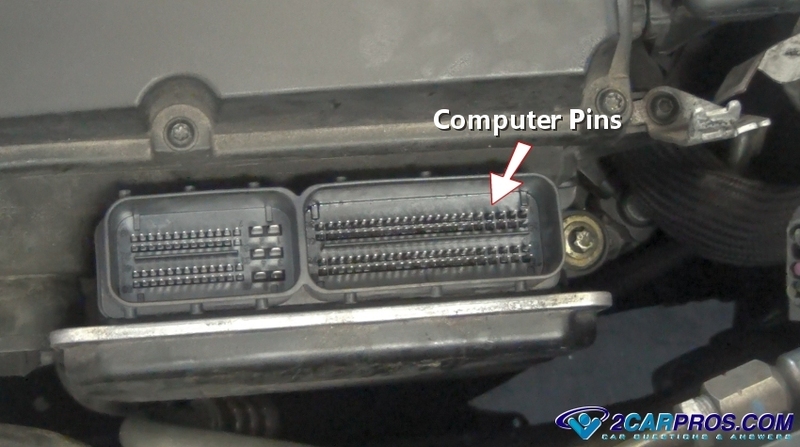 These are the wires you will be looking for at the computer ECU (engine control unit). 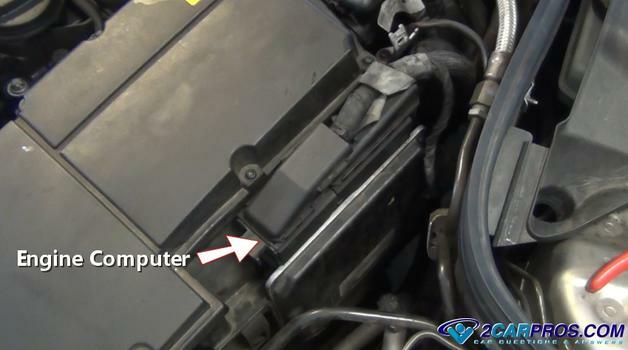 Locate the engine computer which is usually under the dash or in the engine compartment. This one happens to be bolted to the air filter housing under the hood. Locate and release the wiring connector to gain access to the electrical pins which connect the system wiring into the computer. This will expose the connector pins which will be used for testing purposes. While the connector is off check for the presents of engine oil which sounds kind of weird but it has been known on high mileage engines that oil will seep from the sensors, down the wiring and into the computer itself, like little rivers of oil. If enough oil has been pushed into the computer it will short out some of the internal components even though oil doesn't conduct electricity it will saturate compounds which make up the chips, resistors, capacitors and diodes. These connections must be clean and free from dirt, oil, rust and corrosion. The computer has many pins which connect to the various components. Once the main connectors have been removed check the pins for rust or corrosion and clean as necessary. It is a good idea to spray electrical cleaner across these terminals and on the connectors. 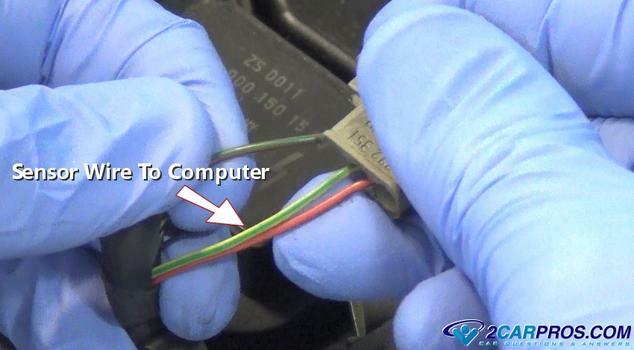 You must gain access to the wiring at the computer to identify the incoming wires. In this case we have removed the plastic cover over the connector. In some cases the wires are exposed naturally. All wires should be clearly visible, look around until you find the same wire color combination and size present at the sensor. 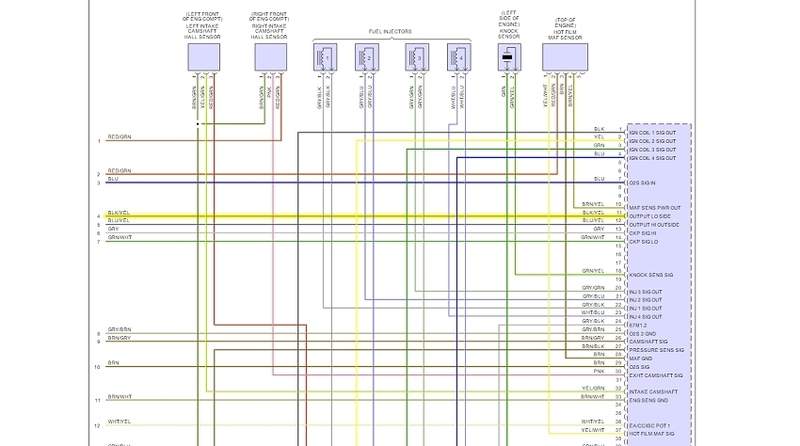 Here is a wiring diagram that can help you see where the wire is headed in the circuit and which pin number in the connector on the computer side. Again it is not needed, but it's good to have for reference. To make sure you are testing the correct wire count the places over in the connector from one end or the other, in this case it is 8 places. This is so when you turn the connector over you know which terminal to test from. 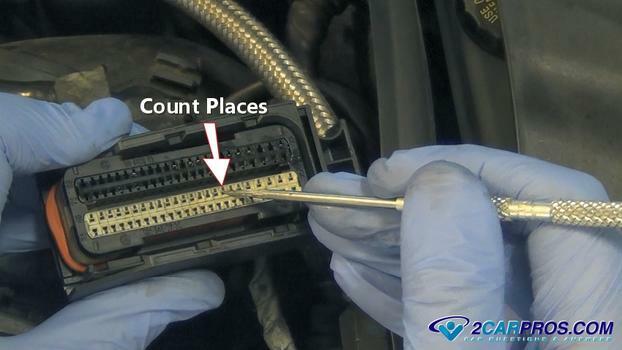 Now turn the connector over and count from the end that you referenced. This will be the terminal used for testing. Now take your voltmeter and switch it to ohms. This will test the resistance in the wire if any. The idea is to have none. Connect the probes to either end of the wiring connectors, the meter with show the resistance in the connection. In this reading .6 is next to nothing and acceptable so the wire is okay. When testing roll the test leads in the terminal to ensure proper connection for a correct reading. If the ohms reading are above 2.0 there is a problem with the wire and it needs replacement. 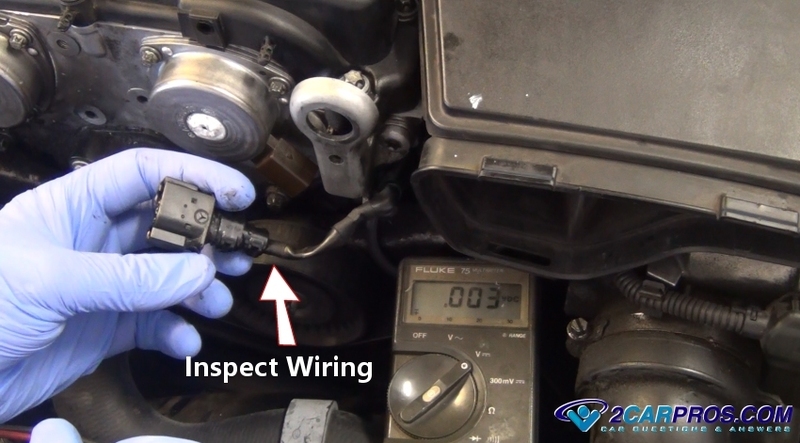 When testing try and wiggle the wires around while holding the test leads steady this will simulate the engine vibrating which can help find intermitted shorts, you might need a helper for this. While performing the test one of the wires in the circuit was found to be bad and had to be replaced this fixed the problem. If you have any questions on how to test computer or sensor wiring please ask our mechanics we are happy to help.